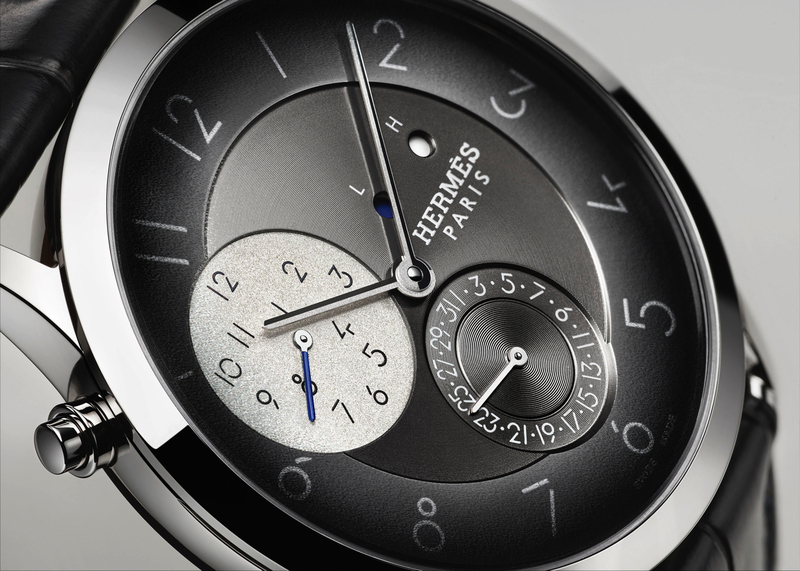 The Slim d’Hermès collection was first introduced in 2015 and features original numerals designed by Philippe Apeloig. 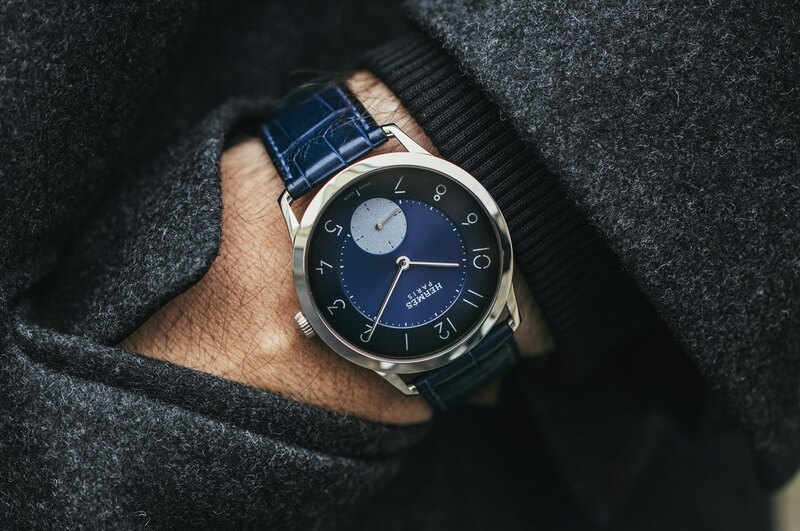 This past week, Hermès announced the Slim d’Hermès GMT watch which has the same fonts and features a unique dual time display presented in a 39.5 mm x 9.48 mm palladium case. Printed in silver, against a dark gray matte sandblasted chapter ring, the hours and minutes are indicated by baton-shaped hands that are half polished and half sand-blasted. The center of the dial features a very fine snailed pattern in gray, and the date subdial at 6 o’clock has a slightly broader snailed pattern for its center and chapter ring. At 10 o’clock is a lighter gray subdial with the same font as the main dial, and numerals scattered instead of in a traditional order. Controlled by the pusher on the flank at 10, this dial displays a second “local” time zone. 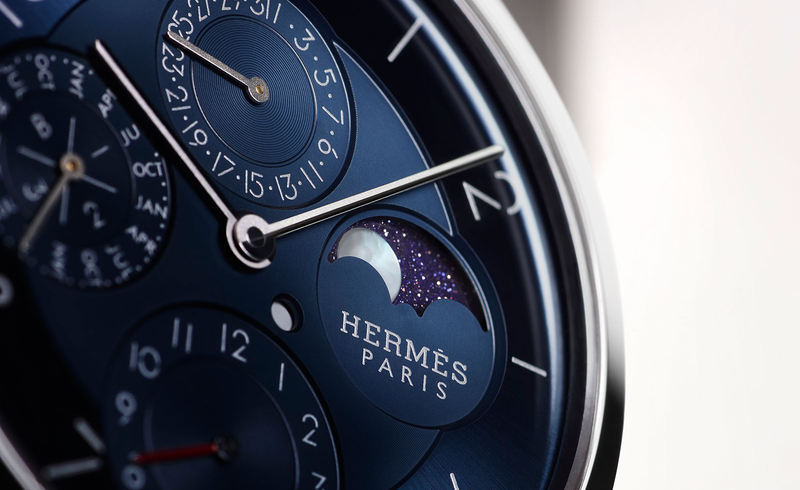 The two small circular apertures above the printed Hermès logo at 3 o’clock are dual day/night indicators, one for local time and one for home time. A nice touch, made possible by the exclusive Angehor module that has been added to the 3Hz micro-rotor powered Hermès caliber H1950 movement (which has a 42-hour power reserve). In my opinion, the Hermès logos stamped on the movement bridges are kind of hideous (the same way I feel about Louis Vuitton logos emblazoned all over a handbag), but at least the dimensions of the watch, the fonts, and the other dial details are quite nice. Naturally, the matte graphite alligator strap is crafted in the Hermès famous leather workshops. 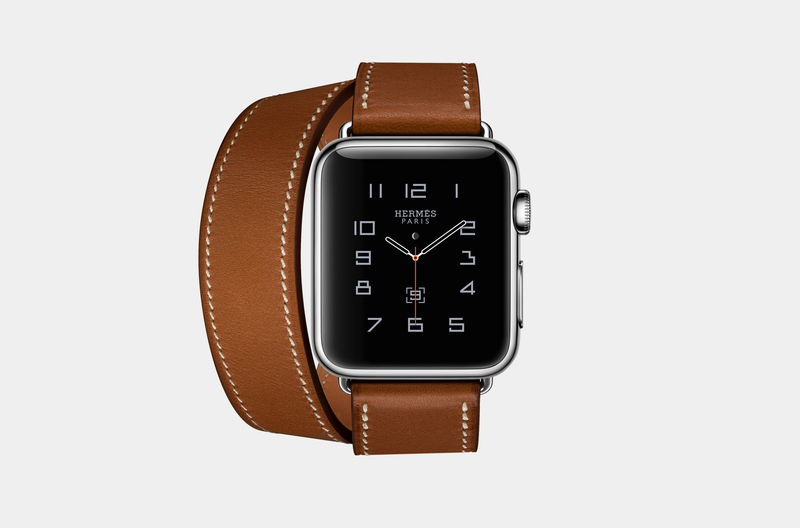 The watch is limited to 90 pieces and will retail for approximately $14,750.